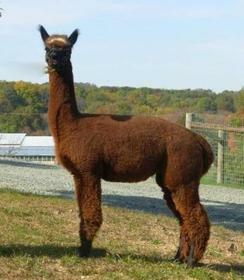 Painted Sky Alpaca Farm welcomes Kasa to our herd! Our "farm ambassador" Kasa is always inquisitive, always nuzzling up to you. She has exceptional compact conformation, and good fleece, with a spot of true black outside the main blanket and white on her head, she represents several options for her next breeding next spring. We haven't made up our mind but know that her pedigree and her color will create a great package with a Painted Sky Herdsire breeding. While we have had excellent results with Kasa and Renegade, we're recommending a breeding to Garrison, either will complement her conformation and extract the dark colors in both their pedigrees.